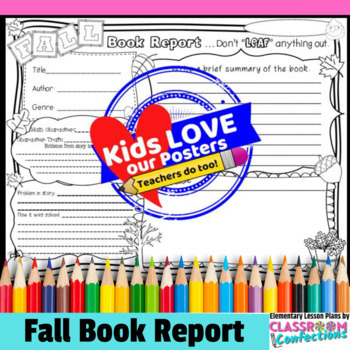 Book Report: Fall Themed Poster Activity Book Report- Don't "LEAF" anything out. Let your students share what they learned from their book using this 8.5 x 11 basic book report poster (prints landscape). This poster will look great hanging outside your classroom during the fall season, and parents will enjoy reading them when they are sent home. This is also a great way to hold kids accountable for their independent reading time, and it can also work great for a literacy center or simply an at-home activity.... many options. The book report poster activity has plenty of places for students to add their own creative touches with color. *Write a brief summary of the book. *Illustrate favorite scene and write a sentence about it. Use as a center activity or even as morning work. Use it in your classroom however you would like. Don't forget to check out my other poster activity sheets.